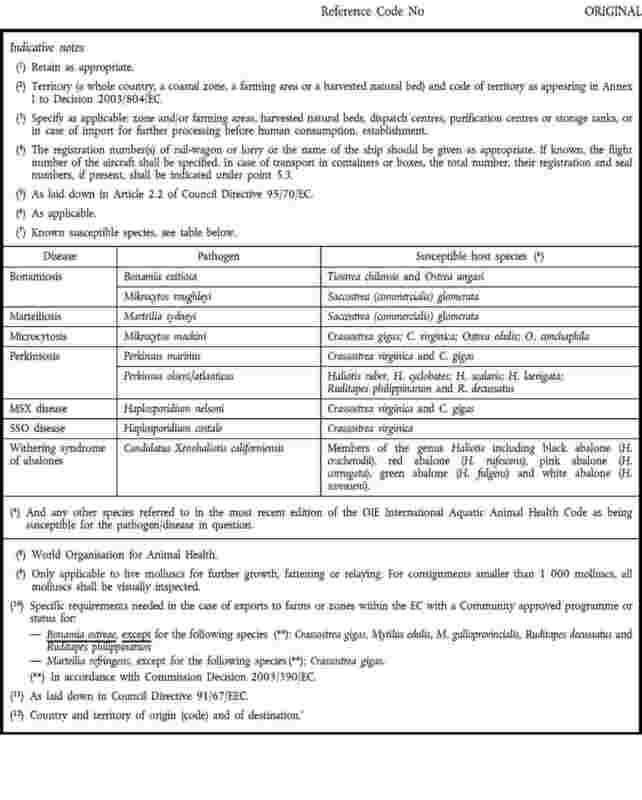 Commission Decision 2003/804/EC of 14 November 2003 laying down the animal health conditions and certification requirements for imports of molluscs, their eggs and gametes for further growth, fattening, relaying or human consumption (2), sets out the specific animal health conditions for imports of live molluscs into the Community from third countries. It is necessary to take into consideration that imports of small quantities of molluscs, often high-value products, directly for retail sale to supermarkets or restaurants, may represent a low animal health risk, as these consignments are not for further growth, fattening, or relaying in Community waters. The requirements laid down in Council Directive 91/492/EEC of 15 July 1991 laying down the health conditions for the production and the placing on the market of live bivalve molluscs (3), and Council Directive 91/493/EEC of 22 July 1991 laying down the health conditions for the production and the placing on the market of fishery products (4), give the appropriate level of protection as regards live molluscs packed in packages of a size suitable for retail sale to restaurants or directly to the consumer, provided the molluscs do not come in contact with Community waters. Additional animal health certification for such consignments should not be necessary. It is further necessary to take into consideration the possibility that imports of live molluscs, which would not fully comply with the requirements laid down in Article 3 of Decision 2003/804/EC for situations where the molluscs are bound for further processing, could be channelled to import centres approved according to Article 8 of Decision 2003/804/EC, and packed in packages of a size suitable for retail sale to restaurants or directly to the consumer. In such situations, the imported molluscs will not come in direct contact with natural waters in the Community. Live bivalve molluscs should be treated as live aquatic animals where they are for further breeding and production, but they may also be considered as products where they are for immediate human consumption, except that they are transported in the live state to preserve freshness. However, as regards veterinary checks, all live bivalve molluscs should be examined in facilities approved to handle products of animal origin, which are more appropriate for handling such consignments. Live bivalve molluscs imported from third countries should therefore be subject to veterinary checks according to Council Directive 97/78/EC of 18 December 1997 laying down the principles governing the organisation of veterinary checks on products entering the Community from third countries (5). Commission Regulation (EC) No 282/2004 of 18 February 2004 introducing a document for the declaration of, and veterinary checks on, animals from third countries entering the Community (6), has replaced Commission Decision 92/527/EC (7). Where live bivalve molluscs are destined for breeding or production the control procedure in Article 8 of Directive 97/78/EC should be used and the common veterinary entry document in Regulation (EC) No 282/2004 completed accordingly by the official veterinarian. Where live bivalve molluscs are imported and intended for human consumption the common veterinary entry document set down in Commission Regulation (EC) No 136/2004 of 22 January 2004 laying down the procedures for the veterinary checks at Community border inspection posts on products imported from third countries (8) should be used and completed accordingly by the official veterinarian. In order not to interrupt imports unnecessarily, taking into account the low animal health risk such consignments represent, the control procedures laid down in Article 6 of Decision 2003/804/EC should be amended accordingly, and Annex IV deleted. is sent directly to an approved import centre for further processing. 1. Live bivalve molluscs imported from third countries shall be subject to veterinary checks at the border inspection post in the Member State of arrival according to Article 8 of Directive 97/78/EC. 2. In the case of live molluscs, their eggs and gametes, imported into the Community for the purpose of further growth, fattening or relaying, the common veterinary entry document provided for in Regulation (EC) No 282/2004 shall be completed accordingly. Annex II is replaced by the Annex to this Decision. (1) OJ L 46, 19.2.1991, p. 1. Directive as last amended by Regulation (EC) No 806/2003 (OJ L 122, 16.5.2003, p. 1). (2) OJ L 302, 20.11.2003, p. 22. Decision as amended by Decision 2004/319/EC (OJ L 102, 7.4.2004, p. 73). (3) OJ L 268, 24.9.1991, p. 1. Directive as last amended by Regulation (EC) No 806/2003. (4) OJ L 268, 24.9.1991, p. 15. Directive as last amended by Regulation (EC) No 806/2003. (5) OJ L 24, 30.1.1998, p. 9. Directive as last amended by Regulation (EC) No 882/2004 of the European Parliament and of the Council (OJ L 165, 30.4.2004, p. 1). (6) OJ L 49, 19.2.2004, p. 11. Regulation as amended by Regulation (EC) No 585/2004 (OJ L 91, 30.3.2004, p. 17). (7) OJ L 332, 18.11.1992, p. 22. (8) DO OJ L 21, 28.1.2004, p. 11.